A one box solution to data ground isolation and long cable runs. 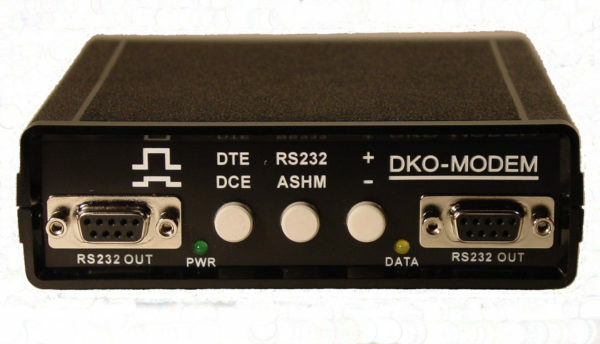 Unlike other modems that require two modems, one configured to transmit the other to receive, only one DKO Modem is needed to receive data and acheive the same result. Extend your Scoreboard or Speed Gun RS232 data up to 3000 feet using just one of these boxes at the receive end. RS232 Data Baud Rates up to 19200 supported. Detects standard RS232 data as current pulses similar to how short haul modems function, without the need to convert the originating signal. Optically isolated to prevent ground loop hum. Front panel switches provide rapid configuration. Power and Data presence LEDs on front panel. Two independent RS232 outputs on front panel. 12 volt wall wart style power supply with 4 pin XLR connector.